When the Nazi blitzkrieg rolled over continental Europe in the early days of World War II, the city of London became a refuge for the governments and armed forces of six occupied nations who escaped there to continue the fight. So, too, did General Charles de Gaulle, the self-appointed representative of free France. In this epic, character-driven narrative, acclaimed historian Lynne Olson takes us back to those perilous days when the British and their European guests joined forces to combat the mightiest military force in history. Here we meet the courageous King Haakon of Norway, whose distinctive “H7” monogram became a symbol of his country’s resistance to Nazi rule, and his fiery Dutch counterpart, Queen Wilhelmina, whose antifascist radio broadcasts rallied the spirits of her defeated people. Here, too, is the Earl of Suffolk, a swashbuckling British aristocrat whose rescue of two nuclear physicists from France helped make the Manhattan Project possible. Last Hope Island also recounts some of the Europeans’ heretofore unsung exploits that helped tilt the balance against the Axis: the crucial efforts of Polish pilots during the Battle of Britain; the vital role played by French and Polish code breakers in cracking the Germans’ reputedly indecipherable Enigma code; and the flood of top-secret intelligence about German operations—gathered by spies throughout occupied Europe—that helped ensure the success of the 1944 Allied invasion. 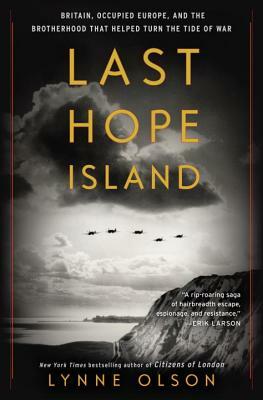 A fascinating companion to Citizens of London, Olson’s bestselling chronicle of the Anglo-American alliance, Last Hope Island recalls with vivid humanity that brief moment in time when the peoples of Europe stood together in their effort to roll back the tide of conquest and restore order to a broken continent. Lynne Olson is the New York Times bestselling author of Those Angry Days: Roosevelt, Lindbergh, and America’s Fight Over World War II, 1939–1941 and Citizens of London: The Americans Who Stood with Britain in Its Darkest, Finest Hour. Among her five other books is Troublesome Young Men: The Rebels Who Brought Churchill to Power and Helped Save England. She lives with her husband in Washington, D.C.